The building at 2815 W. White Oaks Drive houses a State Farm insurance office and the future Meraki Salon and Spa. Photo courtesy Sangamon County. A new salon and spa is slated to open on West White Oaks Drive in Springfield. Jacqueline Cuffle of Sherman obtained a building permit from the City of Springfield on July 20 to begin remodeling part of the building at 2815 W. White Oaks Drive. Cuffle plans to open Meraki Salon and Spa in the space after some light demolition work and addition of new walls, although she’s not yet sure when the salon will open. The building formerly held Sojourn’s Resale. 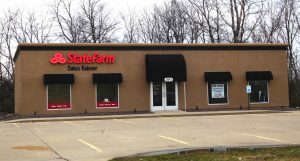 Springfield State Farm insurance agent Daton Kaisner purchased the building in October 2016 and converted it into two commercial spaces. Kaisner’s office occupies one of the spaces, and Meraki will occupy the second. Cuffle, formerly of Willow & Birch Salon in Springfield, says the name of her new business comes from the Greek word translated as “meraki,” which describes pouring one’s soul into a task. The Plaza on White Oaks LLC, owned by Jane Hay of Chatham, obtained a permit for interior demolition at 3001 W. White Oaks Drive, Suite F. The permit indicates it will be a nail salon. Marriott Real Estate Service is the contractor, and the project is valued at $2,000. Delano Law Offices has been issued a series of permits to remodel the third floor of its office at 1 SE. Old State Capitol Plaza. The building also houses the office of the Federal Public Defender for the Central District of Illinois. O’Shea Builders is the contractor for the project, which is valued at $127,099. Kidzeum of Health & Science received a permit to begin construction for its museum at 412, 414 and 416 E. Adams St. The contractor for the $2.5-million project is O’Shea Builders. James and Carol Zerkle obtained a permit for the mechanical portion of the remodel at 619 E. Washington St., which will house Anvil and Forge Brewing and Distilling Company. Element Services is the contractor on the project, valued at $60,000.